Dragon Quest XI is finally here, and we had quite the experience sitting down with Dragon Quest creator Yuji Horii and other members of his development staff to talk about the series and the nature of JRPGs today. Before going over the interview transcript, I just wanted to spend some time talking about the experience. I’m a huge fan of the Dragon Quest series, as I had my first taste of the game when Dragon Quest III (which was titled Dragon Warrior III at the time) came out on the Game Boy. 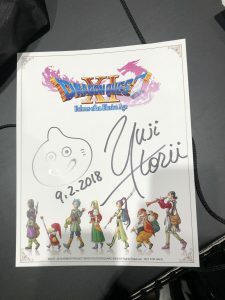 There’s no way RPGs or even gaming in general would be where it is without the foundation that Horii-san created with Dragon Quest, so when I heard that he’d be one of the guests of honor at this year’s Crunchyroll Expo, living just 10 minutes away from its venue, I knew it would be a fantastic opportunity to meet the legend. The day before this interview, I didn’t realize he was doing a meet and greet with fans, so I was kicking myself over not bringing anything for him to sign, but the real honor was showing up anyway to greet him as a fan as he presented us with an autograph and illustration of a slime (pictured above). It was at that point where I knew I was in the presence of a warm and calming individual, and it made the interview so much easier the next day. For transparency reasons, it’s worth noting that the topic of bringing Dragon Quest XI to platforms other than PS4 and Steam were not to be discussed. In addition to Dragon Quest creator Yuji Horii, Dragon Quest XI Director Takeshi Uchikawa, and Dragon Quest XI Producer Hokuto Okamoto were at the table answering questions. Developer profiles on the team can be found following the interview. Dragon Quest has been around for more than 30 years, encompassing all mainstream gaming generations. In this time, what’s changed the most in the writing with the Dragon Quest series? Horii-san: Every installment has a differing story but with an ultimate goal of defeating the dark lord or arch fiend in the story. With all these hardware advancements, we’ve been able to really bring it to life visually as well and really depict those deep and complex human relations that’s been easier to do now more than ever. Those are the elements I feel that may have changed. How do you approach designing the game to make it feel new but retain the Dragon Quest feel? Horii-san: Computers left a cold impression back in the day. The initial idea that went behind Dragon Quest was to craft a warm, heartful world. Even with the technological advancements and whatnot, the core aspect of that hasn’t changed and it’s created the notion of having that warm game world. Uchikawa-san can talk more in regards to the design of the battle system. Uchikawa-san: This isn’t necessarily limited to the battle aspect of the game, but it carries the overall approach that we take when developing Dragon Quest. During development, various new ideas get presented. There is an aspect that we’re trying to create the warm and inviting world that Horii-san mentioned. Two other aspects we feel make the game very Dragon Quest-like. One being the gameplay and game itself being accessible and easy to understand, as well as the game coming with a sense of adventure and excitement. Those are the three pillars we felt have been extremely important to the series throughout and that’s really crafted that unique Dragon Quest feel. Whenever we have new ideas, we reflect those and compare them to those pillars and see what would be appropriate to bring to the new installment. Anything that fits, we accept and bring to the game. With that, we’re able to keep that Dragon Quest feel while bringing that aspect to the game. Given the success of games like Square Enix’s own Octopath Traveler, what do you think of the state of classical turn-based RPGs in today’s gaming industry, especially after we’ve gone through many years of studios going out of their way to abandon the turn-based style with Ni no Kuni II and Final Fantasy XV being such examples? Uchikawa-san: Personally speaking, we’re not saying one excels over the other. It’s not about which is more interesting or better–both have great qualities and facets to them, but it all really comes down to the concept for each of the games and titles and finding what system is most appropriate and fitting for that title and concept. It wasn’t until latter entries in the series where Dragon Quest really gained significant momentum in the states. Were any changes made to Dragon Quest XI with the western audience in mind? Horii-san: With Dragon Quest XI, that was at the top of our minds from the beginning and we did have our overseas audience in mind when developing the game scenario and how western audiences would respond to this story. When we initially started developing the game, it was meant to be a culmination of the 30-year history of the series. In that sense, we wanted to bring all these aspects from the games and bring it all together in Dragon Quest XI. When we thought about bringing and localizing the game for the west, we were thinking about which title really resonated and really took off—and in our minds, it was Dragon Quest VIII. We believe that a lot of our fans and players’ memories are tied to the experiences through playing Dragon Quest VIII. So with XI, we were changing the menu UI, we implemented voiceovers, and we tried to accommodate all those aspects that were received positively during VIII’s release. Just as Japanese gamers jump into a new Dragon Quest title, they still have a sense that it’s the same experience that they learned to love and recall from their experiences with past games. That same kind of quality exists in Dragon Quest XI, where western fans can jump into it, and if they have played previous titles, they’d still feel that it’s the same Dragon Quest they remember from back in the day. What impact has mobile made on the game and what kind of impact do you think it made on the industry? Horii-san: Mobile games are gaining popularity. When you really think about the playability of a game, there are limitations when it comes to mobile devices and when you really want to experience a proper game experience, it really comes down to having a controller in your hands and having that stress-free gamer experience like moving your character around at your will and in that sense, we’d like to continue developing console games with that in mind. Ishikawa-san: Just to kind of supplement what Horii-san mentioned just now, we’re not denying the great aspects of mobile games, but when we initially started development on XI, there was a desire to really bring families and friends together in front of a TV or large screen and really enjoy the game together, talking about it as they proceed and played through the game and really enjoy the time together. That kind of vision and imagery came to mind when starting development and putting it into context when looking back at Dragon Quest I, thinking of children coming home and conversing amongst themselves about what to do in the game. And that’s the similar impression that we wanted to achieve when making Dragon Quest XI – to recreate that atmosphere and environment where people come to their TVs once more and play games together. That’s kind of where things started. What do you want to see from the industry moving forward? Horii-san: (jokes) I think I can go another 20 years. I mean our composer (Koichi Sugiyama) is 87 and still going strong! As for the game industry and where it’s headed, we really feel like the virtual world is essentially going to continue to tap into our real world even further, kind of like VR and other types of technology. When you look at games as a form of entertainment, it also is kind of an escape from reality. There may be things that aren’t going well in life or whatnot, but when playing games, you kind of forget about it and move on. And when you come back to the real world, you may have a sense of growth—you’ve grown a little bit more just from your experiences from playing the games. And so, ideally, I’d like to continue making games that make you feel that way, that you’ve gained something out of experiencing this virtual world. Many developers have commented on how expensive it is to make games these days, and we’ve seen a lot of success for JRPGs in the portable space but less so on home consoles. Where do you see the place for Dragon Quest and JRPGs, as a whole, in the future? Horii-san: I feel like everything is continuously churning. Obviously right now, at least in Japan, there’s a trend that everything is moving towards mobile and handheld, but I feel like there’s always a time where people will re-realize the greatness of console games as well as how great it is to play with a controller in your hands. I feel like people will come back to it, as this continually revolves. Now Uchikawa is many years younger than I am (jokingly), and will probably be developing games longer than I will, so I’d love to hear his thoughts on this! Uchikawa-san: (laughs) My master is essentially Horii-san, so when it comes to the evolution of the industry, I agree with what he says. I don’t necessarily think the industry has to be a certain way—it doesn’t have to be console-driven or portable-driven. The most important aspect of it is to create games that are appropriate for that day and age. As long as we are developing games based on a proper concept based on that notion, I feel like it will still resonate. With Dragon Quest, I want to continue to develop and see how those will continue to evolve and grow. Now you may be surprised (jokingly), but Okomoto-san is actually five years younger than I am, so I’m sure we’d love to hear his thoughts! Okamoto-san: (laughs) Yes, Uchikawa-san, I’m sure that’s hard to believe! For the most part, both Horii-san and Uchikawa-san have covered the majority of what I would’ve said, but I also believe there could be a world where console games no longer exist because when you really think about console games and where they’re headed, it’s really about creating the immersive experience and so when you really continue that evolution, I feel like it’ll reach that point where it’s really that VR experience and so with the VR experience, even advancing technologically, it could result in that environment from Ready Player One – I feel like that’s a potential direction that the industry could head into. I do want to add the fact that regardless of the hardware or device, the part that isn’t going to change is the fun of role-playing and RPGs. It’s really our job to figure out how to create that fun experience within that continuously changing technological environment. We’ve seen sort of a shift with JRPGs with a sudden long-term outbreak of FPS games. Now it seems like RPGs are on the rise again especially with how well Octopath Traveler did and JRPG’s are being accepted again. Why do you think Octopath has been so successful? Horii-san: It’s hard to pinpoint exactly what the reason is, but in regards to JRPGs, the kind of unique aspects of it are the story as well as the fact that as long as it’s turn-based, anyone can essentially play. It really comes to those two aspects. When you really think about FPS games, once you get defeated, you get defeated and it’s hard to get yourself back up and move forward. With JRPGs, they give anyone the opportunity to clear the game and get through to the end. Once you feel that fun of getting to that end and gaining that sense of achievement and exhilaration in completing the game, perhaps a lot of people have started to realize the greatness of actually finishing and completing a game. As a couple of us have mentioned earlier that Dragon Quest XI, in essence, is a celebration of the 30-year anniversary of the series. Can we go around and talk about which of the mainline Dragon Quest games resonated with you the most? (For any reason, including the story or its characters). Horii-san: Of course, Dragon Quest XI! (laughs). But in regards to past titles–specifically with Dragon Quest V–when I finished writing the scenario, it’s really about a story that spans across three generations and about human drama. Once I finished writing it, I felt that it all came together really well, so I’d have to say that’s my favorite. Uchikawa-san: My favorite is Dragon Quest V. To kind of raise another title that left a different type of impression on me is Dragon Quest II which is the first one that I’ve played, and I really liked the way the game is presented and crafted. In a certain instance when you finally have the three party members together, the field music changes giving you the sense of achievement and anticipation that the journey for that party of three is about to start, so I found that really impressive and it left a lasting memory in my mind. That music was so good! Okamoto-san: Why am I always the one to answer last? (laughs) Anyway, the one that has left a lasting impression and the one that I like is Dragon Quest V. This is the game that I played frequently and put a lot of time into when I was in elementary school, but of course, I love Dragon Quest XI! (laughs). In all seriousness though, Dragon Quest V’s scenario is amazing and there’s no doubt about that. But with regards to XI, I really do feel like it’s a scenario that really is on par or potentially even greater than V’s. I wasn’t even on the development team when I was playing V, obviously, but when I first read the plot for XI, that’s when I thought that this was an interesting story and game, and it’s a lot of fun. From that day onward, we’ve been continually developing the game, and even when you play it, you still get that sense of fun from the scenario. That’s how fun it is. Back in the day, when we had memory restrictions, we weren’t able to really develop that whole kind of dialog between party members or the depths of their relationships, and that’s something we achieved with Dragon Quest XI. So yeah, I think the story of XI is just as amazing. Horii-san, Uchikawa-san, and Okamoto-san were indeed guests of honor as they actually were featured in the final panel of the convention hosted by Hop, Blip, and a Jump’s Jared Petty, which delved into Dragon Quest XI and the series’ roots. It was a very enjoyable and interesting panel that saw every attendee walk out with shirt and maybe even a slime. 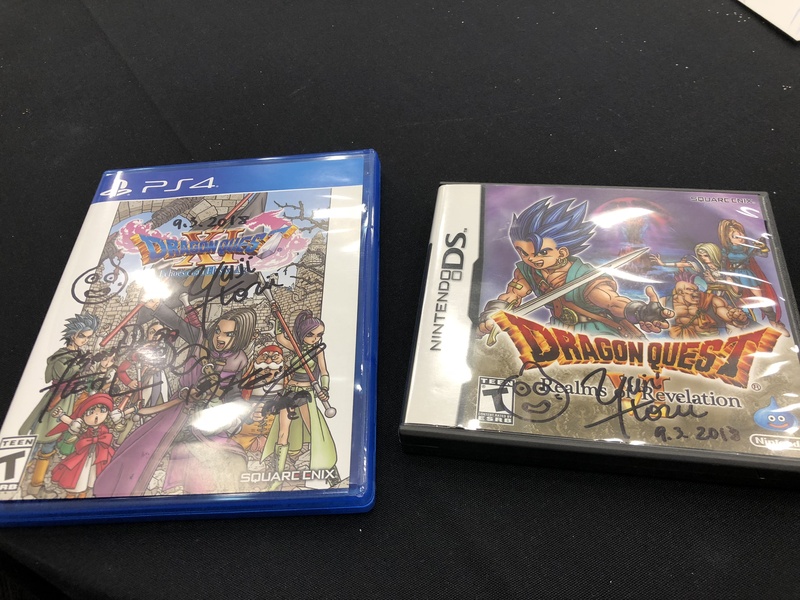 I was floored when I found out I’d be getting a copy of Dragon Quest XI a day before release (signed, no less!). I even got my brother’s copy of VI signed. Again, the experience of talking with these individuals was an esteemed honor I’ll never forget, and making it even better was the fact that we were provided copies of Dragon Quest XI that we got signed in addition to lanyards exclusive to the Square Enix online store. 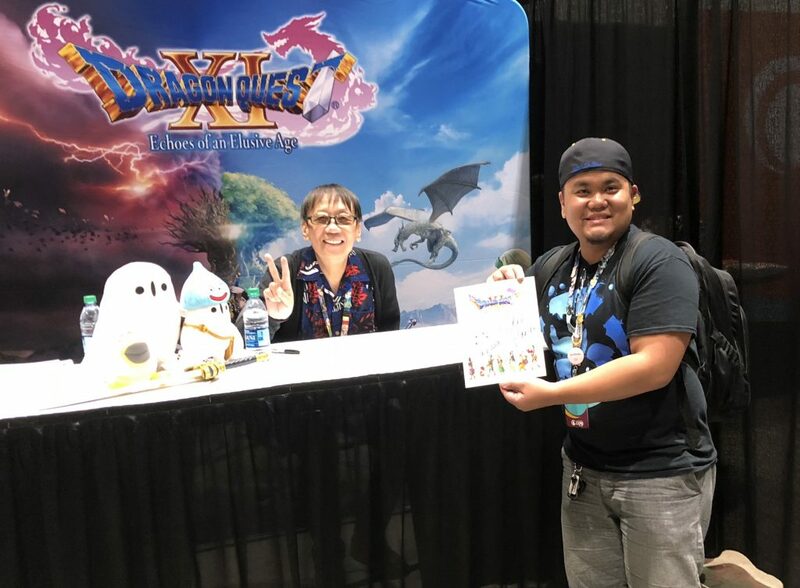 Before we cap things off, I just wanted to give my thanks Stephanie Chang who handles Square Enix PR and Aimee Lee who handles consumer relations with Crunchyroll Expo for their flexibility and time in setting this interview up. As you can probably assume, we were never given a review code, so it’s going to be a while before our official opinions on the game are published. So be sure to check back for that in the coming weeks! For more Dragon Quest XI and other CRX fun, keep it locked to SmashPad.com and check out the Day 0 Update this Sunday for my full impressions on this year’s Crunchyroll Expo! Yuji Horii was born in Hyogo, Japan in 1954. After graduating from Waseda University’s School of Letters, Arts and Sciences I, he worked as a freelance writer for newspapers and magazines. He took his first steps as a Game Designer in 1982 when he won a game programming contest sponsored by Enix (now Square Enix). DRAGON QUEST released in Japan in 1986. The third installment in the series, DRAGON QUEST III, was a national phenomenon, earning Yuji Horii a place at the center of the gaming industry; a position he still holds today. The DRAGON QUEST series boasts worldwide sales of 76 million units. The latest installment, DRAGON QUEST XI: Echoes of an Elusive Age, released the West on September 4. Takeshi Uchikawa joined Square Enix in 2006. Prior to working on DRAGON QUEST XI: Echoes of an Elusive Age, he was involved with the series as a scenario assistant on both DRAGON QUEST IX and DRAGON QUEST X.
Hokuto Okamoto joined Square Enix in 2011. Previously, he was involved with the DRAGON QUEST series as an assistant producer on titles including Fortune Street and Theatrhythm Dragon Quest, before joining the team as the producer for DRAGON QUEST XI: Echoes of an Elusive Age.